We are very sad to report that our organization has lost a wonderful friend. Joe McNeal lost his battle with a long illness in June. We first met Joe years ago when we first started hosting meet and greet events. Joe came in with his greyhound, Blondie, and introduced himself. From that time on, Joe became a wonderful and loyal volunteer. 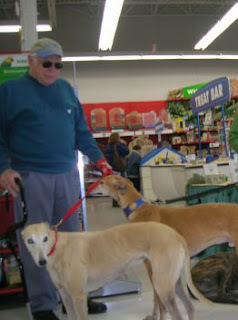 He came to almost all of our meet and greet events – he and Blondie spoke to many people during that time about greyhound adoption. Joe always had a positive and upbeat attitude. No matter what happened, he and Blondie kept up the cause. Everyone in our group was happy to see Joe and Blondie. Between Joe’s illness and Ann’s illness, they were not able to attend as many events. However, their daughter, Joanne, became a Nutro dog food representative so we were all able to keep in touch about Joe and Ann through Joanne. Joe loved greyhounds as much as any person could. We know how much he loved his precious Blondie and would like to think that he and Blondie have finally been reunited. Rest in peace, Joe. You and Blondie were loved by all of us.